Nutralife Health Products Inc. is proud to announce the launch of JointRite, a unique and powerful joint health formula. 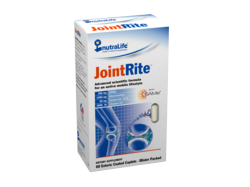 JointRite combines SAMe with other cutting edge ingredients to help rejuvenate joints and cartilage while enhancing joint lubrication for the ultimate in joint comfort. JointRite is available at Walgreens nationwide. Nutralife Health Products Inc. has been a leader in providing innovative low cost/high quality nutritional supplements since 1996. Over the years Nutralife has done extensive research on supplements and has learnt a great deal about consumers’ needs. Now, in addition to offering its full line of superior supplements, Nutralife has created JointRite – a comprehensive joint supplement for the increasing population suffering from joint discomfort. “We created JointRite to directly address our consumers’ needs,” stated Abigail Glass, President and Founder of Nutralife Health Products. “Many of our customers are experiencing the effects of aging on their body, and they can no longer play golf, keep up with their grandkids, or even accomplish their daily chores without feeling discomfort or pain.” The customers of Nutralife are not alone. According to the Arthritis Foundation, the number of Americans who suffer from some kind of joint discomfort has risen to 50 million. Every move we make exerts pressures on our joints. Over time this wear and tear leads to increased discomfort. Additionally, as we age, our body’s natural ability to lubricate its joints diminishes. Without proper maintenance, our joints will be deprived of their ability to function properly. Nutralife Health Products introduced SAMe into the United States in the 1990s, and it remains a leading brand in SAMe distribution. Like all of Nutralife’s SAMe products, JointRite contains the trademarked (S)SAMe, Nutralife’s proprietary SAMe raw material. JointRite is now available in all Walgreens’ stores as well as online by select merchants. “We hope to expand the distribution of Joint Rite into many more drugstore and supplement chains in the upcoming months,” stated Abigail Glass. NutraLife™ Health Products, a women-owned business, was founded in 1996 by two women with one goal: to provide health-conscious individuals with natural, safe, and clinically-proven dietary supplements. Nutralife features a complete line of vitamins and supplements under the NutraLife™ brand. NutraLife™ SAMe products are among the leading selling SAMe SKU’s in the nutritional supplement category according to IRI, and can be found at prominent retailers such as Walgreens and CVS. To find out more about Nutralife Joint Rite, please contact Nutralife Health Products.